I am not a big mythology fan so it was with some trepidation that I picked up The Song Of Achilles, a retelling of the Trojan War from the point of view of Achilles' companion Patroclus. Patroclus is a prince exiled from his kingdom for accidentally killing another boy who comes to live in Phthia with King Peleus and his beautiful son, Achilles. Achilles is of course destined to be the greatest warrior the world has ever seen. Growing up together, Achilles and Patroclus become close despite the disapproval of Achilles' mother, the sea goddess, Thetis. 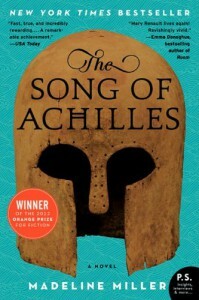 When Helen is kidnapped and the Trojan War begins, Patroclus must face the certainty of everything he has ever loved being taken away.I couldn't have been more wrong about The Song Of Achilles. I thought it was going to be a stuffy read bogged down in mythological details but it was the opposite - it was a beautiful love story and a tale of how events can change and overcome people. Patroclus is a very self-critical narrator which endears him to the reader immediately and Miller does a fantastic job of showing the emotion and fear of falling in love for the first time. Her writing is just stunning, packed with description and emotional resonance;"Had she really thought I would not know him? I could recognise him by touch alone, by smell, I would know him blind, by the way his breaths came and his feet struck the earth. I would know him in death, at the end of the world. 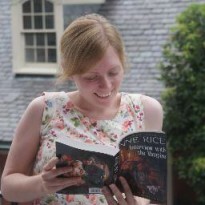 "I don't read much romance but I was utterly caught up in the love story of The Song Of Achilles. Rather than just showing the two characters falling in love, she also showed how that love changed as they grew up and as Achilles' desire for recognition overtook his other characteristics. I was so engrossed in the characters and the world of the book that several of the pages near the end moved me to tears. Even now, two days later, I'm still thinking about this book. Surely that's the sign of an outstanding book, one that doesn't fade from memory?Although the love story is at the heart of The Song Of Achilles, the book is much more than that. For someone who only knew the basics of the Trojan war, I felt that Miller did a great job at making the mythology accessible. I particularly loved her characterisation of Odysseus as a smart, quick-witted trickster who is decent underneath. The horror of war is not shied away from and nor is the nastier side of human motivation. The Song Of Achilles is Miller's debut novel and I can say with certainty that I will read anything she writes next with high expectations.I would recommend this book to anyone - it may be about Ancient Greece and the Trojan war but it's really about the human condition. Half Blood Blues is no longer my tip for the Orange Prize 2012.